Can someone comment on the confusing headline in right and left hand! I don't know whether to treat it as headline or career line starting from upper mount of moon (particularly in left hand). And its interaction with the actual headline and career line( again - particularly in left hand). I would take both as head line. This person has or will likely have a change which affects their thinking in a major way. On the right hand i would call it a broken head line but with connecting lines. On the left it appears that the head line was originally fully connected to the life line, so person was very tied to family, shy etc.. but then new head line is floating, showing Independence and courage. Thank you Sari for clarification. But, what can you decipher on the "thinking" of this person from his right hand lines? If you notice, the upper head line starts with a cross/star! And in the left hand, the headline which is connected with the life line, intersects with the new headline which comes from the mount of moon. What does this indicate? Request to Others - please write your views. I would blend the idea of thinking and productivity together since in particular in the left hand this crease moves from head line territory to fate line territory. One of the main things I notice is the variety of distances in the quadrangle area, or space between head lines and heart line. Could relate to extremely different moods and attitudes in different circumstances. She may be confusing to understand to people as she may appear to be easy going and adaptable and then suddenly have very important needs to be met before she'll comply. etc. 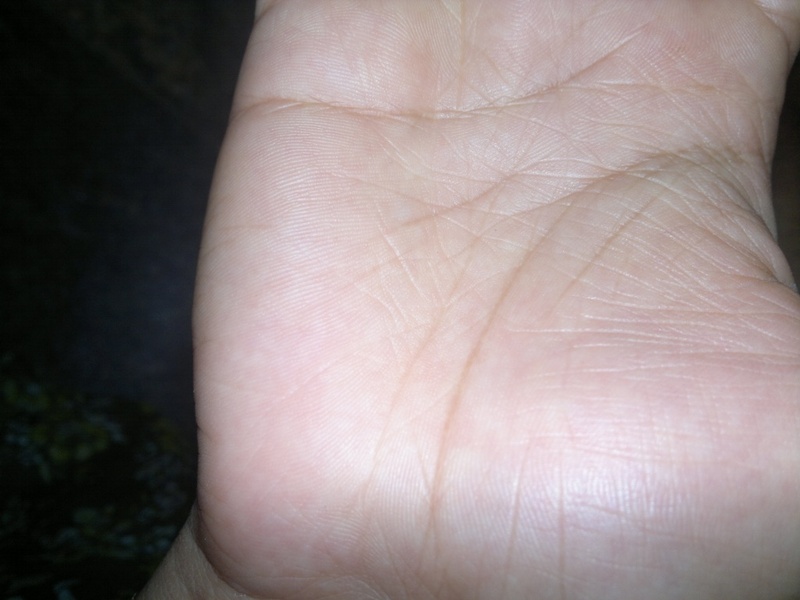 This second 'head line' begins under the middle finger and that is where the quadangle becomes closer together. Judgement would play a role in the change in attitude. She has a different (flexible and easy going) outer personality that she presents than the one that people see who know her well. I also think there is a connection between the inner life line or line of Mars and the higher up head line. Mixing protective resistance with thinking with judgement. Do you know this person? Would you say she can be passive-aggressive? Appearing to be very adaptable but somehow maneuvering things in her direction. Kiran.Katawa wrote: Thank you Sari for clarification. I don't look at this as a cross/star on the head line, but a mix of connecting lines to the first part of head line combined with fate line and influence lines coming from the Mars side. Early childhood would have had problem, or difficulties or worries. Actually likely up to the age of 21ish. Yes, I know this person. She is the same person about whom I had posted in "A case of surgery and shame & guilt" a month back. I don't know whether she is moody. But, yes! she has passive-agressive nature. She doesn't speak when questioned, remain silent and the person having spoken for few minutes have to leave her without hearing anything. She had told me couple of times that - "Usually, I do the things and show, rather than just telling something". Yes, she appears to be easy going, quite silent and shy gal in the first appearance. But, as you get closer to her you realize that its hard to get along with her and she is quite straight and agressive in her speaking. 'coz of her double headlines in right hand, she had told me that - "She gets confused a lot and can't decide". 1. There is a STAR formation at a point, under the Saturn finger( at which a line from lower Mars meet) between new head line, fate line and a line going from headline towards heart line( this line acts as a diagonal bar). What do you interpret here? 2. What does a lower headline indicate: Is it like, she is very careless, tending in her tendencies towards physical needs etc? And with upper headline, she developed some strong values and morals( as its also starting under Saturn finger)? 3. What do you mean by "Judgement would play a role in the change in attitude." 4. "She has a different (flexible and easy going) outer personality that she presents than the one that people see who know her well.". You're saying this 'coz of the difference in the size of the rectangle on the right and left side of the palm( represnting inner and outer lives). That's a nice observation! 1. Her straight headline bumps up after being crossed by the new headline which goes to the mount of moon. 2. The beginning of this 2nd headline(which is going to moon) is also marked by an independent STAR. 3. The intersection of both these headlines! Hi Sari, Yes, the childhood was problematic. But, not severely. However, there was a serious incident at the age of around 23 in her life. What do you say about the intersecting headlines in her left hand? 1) I can't see this. 3) Where this head line section begins is under the middle finger which I relate to things like judgement, responsibility, values and principles. Things which relate to experiences that bring wisdom. So, the initial personality is reflected by the attached head line which is team oriented, and being in a space with a wide gap between it and the heart line would show the adaptability. Once she's past initial starts (beginning of a thought, beginning of a friendship, etc) the higher up head line's energy shows. Narrowing the space between the head and heart line increases a person's need for preferences to be met. Under the middle finger would cause her sense of values and judgement to become active so she could appear to become self-righteous or feel her way is the only right way or similar behaviors. She could also become controlling. 1) This is interesting and unique. Kind of a star burst where they meet. There's short vertical bar that seems to stop the straight head line from continuing through. The line that continues on the other side of the diagonal 2nd headline/fate line combo, looks like it might be related to an influence line from inside the life line that is fragmented in its formation. There's a lot of 'interference' type energy in the creases under both her middle fingers. There are star like features, broken and/or double head lines and this is where both head lines interact with the fate line on each hand. If it wasn't for this heavy ended 'Saturn' energy she'd be very adaptable and easy going. 2) the higher up head line? Star? Star like patterns relate to excitement. Explosions of energy or sudden bursts of energy. 3) I think it's just as you described it... an intersection. One never knows which direction the energy may travel. Maybe that's why she feels confused. It is interested that you commented that she had an important experience at age 23. I think she was born with the broken or double head lines, so it's interesting that during her early and mid twenties these lines are not consistent or typical. Kiran, did she have difficult experience in rather early childhood? 1. Yes,It looks like a fragmented part of an influence line. I never noticed it. No Boaz. As much as I know - NO. I too have asked her about this. But, she says NO. Thanks Kiran, I met two people with missing starting part of head line and both had traumatic childhoods so that may be an option, but here the situation seems different because there are two pieces to the line. Oh! Okay. Yes, in her case, the headline exists in the earlier part. However, there is a 2nd part to it also and these 2 are intersecting. That's why it has become confusing to me. I would read each crease individually. I would pay attention to their direction, where they come from and where do they go, as well as their quality - and then all this in combination and in comparison with each other. The star pattern you see there, I would interpret as relating to an impact of the various energies meeting and combusting suddenly. Maybe occasional sudden unexpected outbursts. The can be in a positive sense, too - just a lot of sudden energy. Notice how the horizontal bar that makes the connection appears deeper than either of them that it connects. It is serving in some way as a head line. I would think there would be some kind of 'circuit-breaker' energy going on. I also keep thinking of train tracks that can be switched over to another track. I think if you could have a good dialogue with her about how she might relate to this way of how her mind works, you could work out what influences the triggers that switches the track (attitude). The influence line we discussed in the other hand probably is related. I wonder if she had a bit of a conflict within herself wanting to rise up and succeed but upbringing was too traditional in some way. Again, this higher up headline is influenced by the middle finger and not the index which would be typical of the independent headline standing alone. Her sense of independent thinking would relate to the things I mentioned earlier... i.e. judgement and values. zaobhand wrote: Thanks Kiran, I met two people with missing starting part of head line and both had traumatic childhoods so that may be an option, but here the situation seems different because there are two pieces to the line. Hello Boaz, got to know that there was an issue at the age of around 11-13 in her life. Her dad was cheated in business and has to sell the house to repay the loan. This all started from around 11 and eventually the house was sold when she was 13. From a good economic background, the family alomst came to streets and then the whole family moved to her mother's place and settled there. However, everybody at home started to go to work on daily wages( during free time) for earning bread. This continued till she reached around 15 and things turned out well( as the elder sistes of the family got a job and she took care of the rest of the family). Hi Patti, yes, I got some info from her past, which I have detailed in another post addressing Boaz. yes, the family and the circumstance were very influenting. One last query: In one the previous postings you said: "I also think there is a connection between the inner life line or line of Mars and the higher up head line. Mixing protective resistance with thinking with judgement." Why do you say: its a protective resistance? Isn't it an agressive thinking of hers? I know she is very agressive in her talks. Thanks Kiran, I was thinking of an earlier childhood and possibly more traumatic, but this could also be relevant. I see an inner Mars line as protective and shielding. It slows down or blocks influence lines. I wonder if the aggressive communication is a sort of compensating behavior. She is probably aware that people see her as initially ineffectual or assertive and she overcompensates by being as you call it aggressive. What do you mean by aggressive anyway. Bully? Demeaning? Controlling? Argumentative? Pushy? Challenging? etc. when I say aggressive, its argumentative, pushy etc. She raises her voice and tells you directly on your face whatever is the issue. Then we would need to look at more things, like fingers and how the hand is proportioned. The base/heel of the hand looks full. 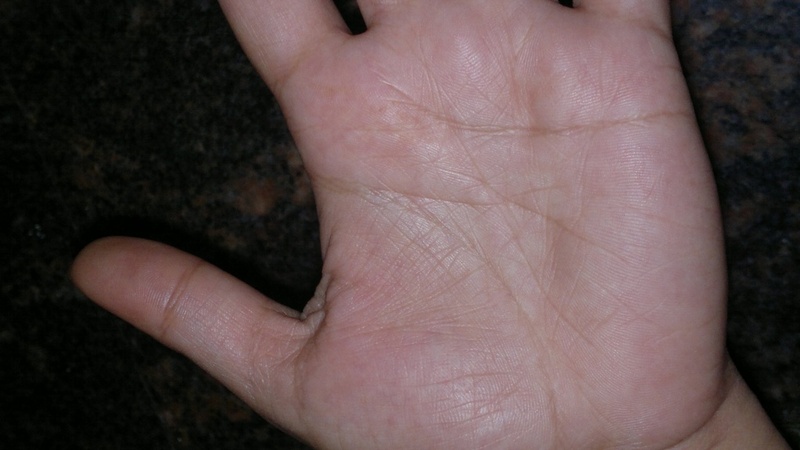 I have read, but not confirmed, that a star on the head line and the way it is formed on this left hand, is a sign that the person has lost someone close and it had affected the person to such a great deal that their life has changed dramatically, so much so that it shows in the head line changing it's direction and origin. But otherwise, I have not seen this formation before. Generally though any disturbance in the flow of the head line refers to the thinking process and how smoothly the thoughts and ideas come. She might suffer from being able to think clearly sometimes. Okay. Yeah Sari, she lost a good relationship also around the age of 23. I think this explanation has a lot of common sense to it, that a dramatic loss can cause a explosive star like formation and cause changes in life directions. But, most people have a loss of some kind in their lives that feels dramatic to them personally. I would think this pattern would be more common if that is what it represented. I also think this strong of a break and the depth and location of the creases show that they very likely formed this way early on rather than after the fact or experience. Since these lines were already present, this could have been warned to her earlier itself? !